Today silver price in India given in Rs/Kg. Today silver price in India is 37,006 rupees per kilogram. This calculator uses the current Silver Price Calculator price for India only. Other prices for other countries, click here or for other cities, click here. 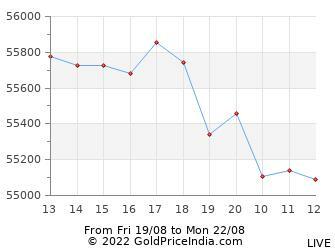 India Silver Chart showing prices over the last 12 hours excluding weekends. 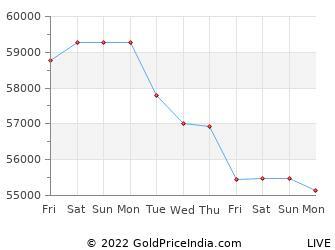 Last 10 days silver price in India given in rupees per gram and in rupees per kilogram. Silver price in India varies across cities due to local market factors like state government taxes, policies, transportation charges and availability. Highest silver price in India in the month of April 2019 was 38,119 rupees kilogram while the lowest silver price was 22,204 rupees. 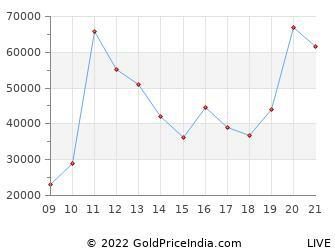 Silver price on 01 Apr 2019 was 37,636 rupees per 10 grams. Highest silver price in India in the month of March 2019 was 39,151 rupees kilogram while the lowest silver price was 37,287 rupees. Silver price on 01 Mar 2019 was 38,314 rupees per 10 grams. Silver price at the end of month was 37,768 rupees. Highest silver price in India in the month of February 2019 was 40,903 rupees kilogram while the lowest silver price was 39,172 rupees. Silver price on 01 Feb 2019 was 40,588 rupees per 10 grams. 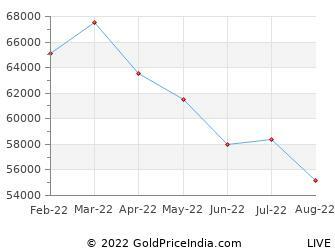 Silver price at the end of month was 39,172 rupees. Today silver price in Dubai given in rupees per kilogram. Historical data of today silver price in India given in rupees per kilogram. To know more click here.